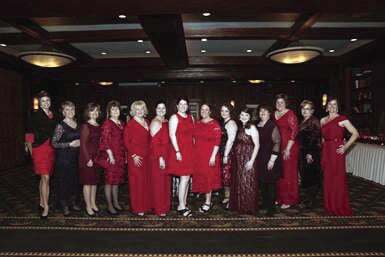 LACONIA – The 15th Annual LRGHealthcare Red Dress Gala presented by MB Tractor & Equipment will be held Friday, Feb. 8 at Church Landing at Mill Falls at the Lake. With a sold-out crowd, the evening will feature a meal created by The Common Man culinary team, dancing to the Eric Grant Band, and a live auction courtesy of auctioneer Jesse Thompson. Funds raised will benefit cardiac services and technology at LRGHealthcare. This year’s live auction will feature items including a golf & stay package at The Abaco Club in the Bahamas, donated by Meredith Bay a Southworth Property; a 2019 concert package from Bank of New Hampshire Pavilion; a Master’s wind jacket signed by 14 PGA golfers, set in a display case donated by Dr. & Mrs. Paul Racicot; a 2019 social membership for the family at Akwa Marina Yacht Club; a private catered event courtesy of Annie’s Cafe & Catering; a six-course harvest-style plated dinner for 16 guests courtesy of Contigiani’s Catering Service; an alfresco dining experience for 30 guests on the Faro Italian Grille rooftop deck overlooking Lake Winnipesaukee; a corporate suite for 20 at a 2019 New Hampshire Fisher Cats game which includes food and VIP parking from Independence Financial Advisors; a customizable digital marketing package donated by SnapROOT Creative Marketing Guru; an one-night stay in the harbor view parlor suite at the Boston Marriott Long Wharf; and a five-course chef’s choice dinner for six at either the Concord or Laconia O Steaks & Seafood location, which includes limousine transportation courtesy of ASL Limousine. There are still opportunities to include an item in the live or silent auction. Contact Becky Doherty at 603-527-7063 or philanthropy@lrgh.org for more information. The committee is grateful to the event's generous sponsors. Presenting Sponsor MB Tractor & Equipment is joined by Candy Bar Sponsor Lovering Volvo Cars Meredith; Cocktail Reception Sponsor MRS – Medical Management & Reimbursement Specialists, LLC; Entertainment Sponsor Lakes Region General Hospital Auxiliary; Late Night Snack Sponsor DiGiorgio Associates Inc./Monitor Builders Inc. – LiRo Group Companies; Photo Booth Sponsor Bank of New Hampshire; Bronze Sponsors AutoServ of Tilton, Bay Point Financial, Binnie Media, CGI Business Solutions, Contigiani’s Catering Service, Consolidated Communications, Creative Marketing Guru, Faro Italian Grille, Franklin Regional Hospital Auxiliary, Franklin Savings Bank, Lawson Persson & Chisholm, PC/Lakes Region Airport Shuttle, LRGHealthcare Nursing Leadership, LRGHealthcare Senior Leadership Team, Northern Design, Northway Bank, Dr. & Mrs. Paul Racicot, Right Realty Group LLC, Salon Amara, Mark & Patricia Weston, and Dr. Zamora and her Caravan of Migrants. Community Partners include Cross Insurance; New Hampshire Oncology-Hematology, PA; Taylor Community; and Tufts Health Freedom Plan. Major event supporters include Atlantic Broadband; Church Landing at Mill Falls at the Lake; Geoff Cunningham, pianist; Divine Inspirations Design Studio; Eric Grant Band; JMG Marketing; Lakes Region Floral Studio; Lee’s Candy Kitchen; MW Animation & Video; SnapROOT Creative Digital Marketing; Stacey Brobst Photography; The Common Man; Jesse Thompson; Tylergraphics, Inc.; VT & NH Photo Booths; and WB Media1. For more information, contact the LRGHealthcare Office of Philanthropy at 603-527-7063, or philanthropy@lrgh.org.